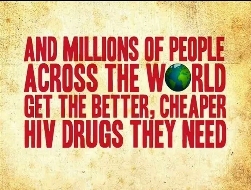 In an October 7, 2010 letter, the head of the Global Fund to fight AIDS, Tuberculosis and Malaria, congratulated UNITAID for the announcement of an agreement between the U.S. National Institute for Health and the Medicines Patent Pool for the voluntary license of the NIH patents rights on an HIV-AID drug, Darunavir. Denouncing the high price that the Global Fund recipients are paying for this product, in some cases USD 10,000 per person per year, the Global Fund letter notes the importance of the Medicines Patent Pool, and its objective of reducing treatment costs by facilitating a more efficient and sustainable licensing of essential patented technologies and promoting generic competition in developing countries. The Oblates of Mary Immaculate have joined other faith-based shareholders in the Interfaith Center on Corporate Responsibility in calling on pharmaceutical companies to participate fully in the newly formed UNITAID patent pool.